The impressive sound coming from multiple directions is further enhanced by the presence of subwoofers in any stereo system. Subwoofers are the perfect backbone for your stereo system. They provide a low-frequency audio perspective which complements the high-frequency range of loudspeakers thereby ensuring improved sound fidelity from the listener’s end. The desire for high fidelity of sound underlines the importance of subwoofers in any stereo system. They come in various sizes, types and have varying output capabilities. No worries though because making a choice should be much easier at the end of this review of the best wireless bluetooth subwoofer. 1 Best Wireless Subwoofer Reviews 2019 – What are Subwoofers? Best Wireless Subwoofer Reviews 2019 – What are Subwoofers? A subwoofer (sometimes clipped to sub) is a speaker that may contain one or more woofers enclosed within the speaker casing and is exclusively dedicated to producing sounds at low-pitch frequencies. The sound at these frequencies is called bass. Subwoofers form a part of an audio system and essentially, they give a unique audio impression, which gives some form of backbone or deep feel to your music or speech. The typical frequency range for a subwoofer is about 20–200 Hz for consumer products, below 100 Hz for professional live sound, and below 80 Hz in THX-approved systems. Technically, the term ‘subwoofer’ refers to the speaker driver in common parlance, the term often refers to a subwoofer driver mounted in a speaker enclosure (cabinet). Subwoofers could be connected wirelessly or via cables. Wireless subs employ wireless technology for its communication using Bluetooth and/or the 802.11 a/b/g wireless standards. They ensure a clutter-free environment and save you the stress of connecting cables. They are easy to set up and boast very high performance. Subwoofers improve the listening experience when watching a movie, listening to music or playing games. A sub may not be really appreciated until you experience first-hand what it means to have it incorporated into your audio system. With its ability to hit a range of low-end frequencies, audio satisfaction is drastically improved and full utility of the experience is enjoyed. Subwoofers can be divided into types – Active subs and Passive subs. This division is based on the amplifier power supply. Amplifiers are devices that increase the strength of a signal by adding some gain to the original signal. Their importance in the proper functioning of subwoofers cannot be over-emphasized. Special cables called “crossovers” are used to ensure that low-frequency sounds are directed to the subs and no other speakers designed for the production of high-frequency sounds. These are subwoofers that come with a built-in amplifier. They are also referred to as powered subwoofers. Enclosed in the active subwoofer cabinet include a subwoofer driver, equalizer controls, crossover (adjustable), room correction technology and digital amplifier. They are powered by supplying AC power (120V or 220V) to it through its power cable or cord. They are used in homes, studios and for outdoor use as well. For that rich, deep bass sound, active subwoofers are the go-to subs. Powered subs are bulky and less compact which means they are always fixed in position. They also cost more than their passive counterparts. These don’t come with built-in amps but rather have to be powered by an external amplifier. Passive subs contain only the speaker driver and/or enclosure. The external amplifier supplies the sub with the signal after amplification. Typically, they are less bulky and more compact that their active counterparts hence it makes them a good choice for small enclosures. Also, they cost less and are very portable. They find use in cars. One downside to the passive subwoofers though is that they feature a lot more cables and component, which make them a little more difficult to operate for the average consumer. A wireless subwoofer is more of a kind of a powered sub that is connected to the audio receiver through wireless technology (WiFi or Bluetooth). This removes clutter around the sub and takes away that unwanted sight of speaker cables or wires. As a kind of a powered subwoofer, they come with their own built-in amplifiers. The wireless communication between the receiver and the sub is facilitated by transceivers (transmitters and receivers). Communication is done through radio frequency (RF) i.e. transmitters sends signals to the receivers via RF. Wireless subs operate within a wireless band of 2.4GHz. There may however, be interference of signals from other appliances such as microwave, mouse and other wireless compatible devices. The 802.11a/b/g wireless standard is employed in wireless subwoofers for communication. The Polk Audio PSW10 Sound Bar and Wireless Subwoofer System is a product of Polk Audio and one of the best of their collections. Polk Audio is one of the most reputable brands in the audio speaker industry. As an industry leader, they boast a collection of reliable and best-seller products. 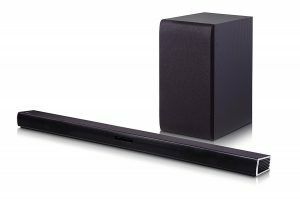 The PSW10 home theater sound bar system is just 2 inches tall but it delivers to you great sound while the subwoofer produces a thrilling bass sound from your smartphone, tablet, iPhone or laptop such that you can feel the sound. This unit does not come with any installation challenge as there are no wires or cable to set up. Its patented voice adjust technology permits clarity of sound such that you can hear every note that is being hit or word that is being said. Setting up for use is really easy. The sound bar has a dimension of 14 x 16.13 x 14.38 inches while the subwoofer has its dimension as 14.3″ tall, 14″ wide, and 16″ deep. The total item weight is 32 pounds, so getting it around shouldn’t pose any difficulties. This best wireless subwoofer has in it , a smart IR learning technology which allows it to learn the frequency control of your TV remote such that you may not need another remote control for the system. The subwoofer of the system uses a bass reflex enclosure. Polk Audio use exclusive bass drive technology to improve lower midvrange, upper bass tonal richness and transient response speed for an improved output capability. For a proper guide on the use of this product, consult the user manual in the shipping box. This should guide you through the very easy setup and enlighten you more on the product. The brand Samsung needs no introduction. The very mention of the name Samsung pullulates the entire atmosphere with confidence, assurance, and top-notch performance. 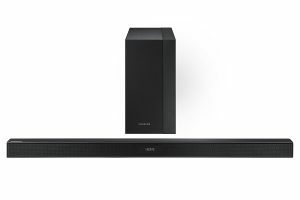 The Samsung HW-K450 2.1 Channel 300 Watt Wireless Audio Soundbar and Subwoofer (2016 Model) creates the impression of sound thrills that excites the hearing and listening senses for the utmost sound hearing satisfaction. This wireless (Bluetooth) subwoofer allows for a clutter-free environment through the use of Bluetooth wireless connection for your ultimate sound pleasure. This best wireless subwoofer from Samsung is ported and has an output power of 140 Watts. The sub has a dimension ofWxHxD:7.0×14.2x 11.8 inches and a weight of 10.1 lbs. The Samsung HW-K450 is built to last. It has a very strong build and construction that would outlast many of its peers. Samsung technology enables the remote app sync feature on the sub such that the sub can be controlled by synchronising an app remotely from your wireless compatible device. It is also compatible with the android mobile community. This sub comes with a wall mounting feature that further increases its placement options as it could either be mounted or placed on the floor. LG Electronics don’t need much introduction as they are an established household name in the household appliances and electronics industry. As a renowned brand that has been around for quite some time, you can place your money on any LG product without any fear of getting a lesser value than what you have paid for. Packaged in the box are the sound bar, the wireless subwoofer, 2 AAA batteries, power cord, remote control and user manual. LG Electronics SH4 2.1 Channel 300W Sound Bar with Wireless Subwoofer (2016 Model) comes with a subwoofer dimension of 12.5 H, 9.75D, 6.75 W (inches) and a weight of 14.4 pounds. The 6-inch subwoofer would perfectly complement your sound bar by providing sounds from those low-end frequencies for matching mid and higher frequencies from other speakers. The remote control of this appliance could be used to adjust the bass volume of the entire unit. The sound sync technology links the sub wirelessly via Bluetooth. Adaptive sound control: This feature is one of the selling points of this product. It has the ability to adapt itself to whatever sound that is playing and adjusts properly to produce the ideal sound suitable for your listening experience. Bluetooth connectivity: This feature allows you to stream music directly from your Smartphone or other compatible devices, wirelessly, for a smooth experience. Free 60 days tech support: LG offers sixty days of technical support on this sub to help you overcome challenges you might encounter during set-up or use. The support team can help you set-up, configure, connect and troubleshoot so that you can derive maximum satisfaction from your purchase. Indicator lights for showing when in use and when not in use. Unlike many other subwoofers that come in no more than square-shaped boxes, the Sonos SUB Wireless Subwoofer comes with a very sleek and portable design and in a somewhat square O-shaped figure. It is just as convenient to fit in your room as fitting a ring into your finger. Simply put, this best wireless sub is a beauty to behold. It is available in two colours – black and silver. Both colours coat over the glossy finesse finish of the sub. This product has a dimension of 20.1 x 10.6 x 20.1 inches and weighs 36.3 pounds. The subwoofer’s unique O-shape helps to maximize sound quality and also add some pulchritude to the product. A mixture of performance and beauty you say. The package contains the following content: The Sonos SUB, power cord, Sonos quick start guide, and Legal/Warranty information. The sub has buttons on its side panel and a LED light which indicates the status of the subwoofer. 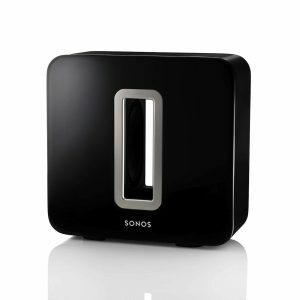 The SONOS uses the 802.11b/g wireless standard and a 2.4GHz wireless band for its wireless communications. With the Sonos, you can play your favourite songs from your phone and wirelessly. The two speaker drivers sit opposite one another such that there is a force cancelling effect and a deeper, fuller bass sound void of buzzes is produced. Using this sub allows your loudspeakers to focus on hitting the mid- and high frequencies while it takes care of those low and very low frequencies for your listening pleasure. Placement and mounting of the Sonos is very easy as it could either lie flat on the floor or stand tall. It comes with rubber feet to prevent scratches and a felt feet if you opt to lie it flat on the floor. Klipsch is known for the high-tech perfection of its products and this sub-12HG Synergy Series is no exception to their trademark production. Finely constructed and built to produce deep bass that reverberates through the room. 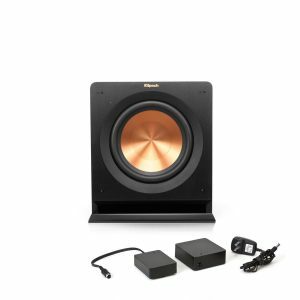 The Klipsch R-110SW 10″ Powered Subwoofer with WA-2 Wireless Subwoofer Kit package includes R-110SW 10″ 200 Watt Powered Subwoofer FREE WA-2 Wireless Subwoofer Kit, R-110SW 10″ 200 Watt Subwoofer R-110SW. This sub features spun copper front-firing cerametallic woofers that are impressively light but very strong and durable. It has a brushed black polymer veneer finish and a gold-coated speaker. The R-110SW provides a remarkable low-frequency response with minimal cone breakup and sound distortion. The technology employed for the firing slot port helps to minimize port noise for clear and undistorted low frequencies. The front-firing design allows flexibility during placement. At the back of the sub, resides the low Pass Crossover and adjustable phase control knobs which enable you to tune the subwoofer to your hearing preference establishing the ideal level of bass to complement the high frequencies produced from your loudspeakers. The sub comes with an AC adapter that is used to power the sub through a 120V AC supply. On first use, the WA-12 wireless kit syncs the transmitter and receiver. To use the wireless connection though, the sub would have to be left in the On mode rather than the Auto mode. WA-2 Wireless Subwoofer Kit that permits wireless connections from any location within the room. This syncs the transmitter and receiver during the first use. 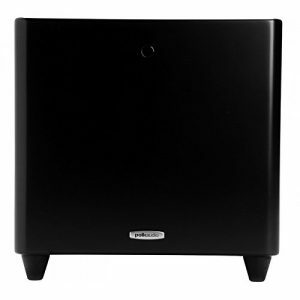 Polk Audio subwoofers are well-renowned for their deep musical bass sound. The Polk DSW PRO 550i is no exception to Polk’s already impressive collection of subwoofers and with the Polk Room Optimizer (PRO) technology, the DSW PRO 550wi subwoofer would fit anywhere within your room and still produce thrilling sounds. The intelligent digital amplifier in the DSWPRO550wi effortlessly drives its 10-inch woofer with a stunning 400 Watts of continuous power and weighs 41 pounds. This item has a unit dimension of 15 x 15.5 x 16.12 inches and is compact enough to be placed almost anywhere in your room. It comes with Polk’s distortion technology which ensures you crank your volume up to high levels during use. The DSWPRO 550wi is a different breed of subs as it has the ability to adapt to your room with its many features. Polk employ their own state-of-the-art Klippel distortion analyser for the optimisation of the woofer’s motor structure, voice coil alignment and suspension to ensure the best performance is delivered at all listening levels. For your ultimate gaming pleasure, music fantasy and a cinema-like movie experience, coupled with its dazzling high-performance and inexpensive price, this best wireless subwoofer is a very good choice. Also, it has four available pre-set options for room optimisation which in turn fosters better bass production and blending setting for your room. 5-way binding posts for speaker level inputs that allow for easy connection to any system. “Night Mode” setting which can be used to temporarily lower the sub’s intensity using the quick and easy toggle on the remote control. 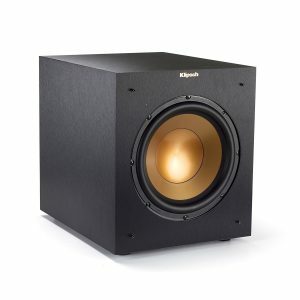 The Klipsch R-10SWi 10-inch Wireless Subwoofer has made this list of best 10 wireless subwoofers for its ability to produce those low-frequency notes with utmost clarity and shaking that reverberates through the room. This 10-inch powered subwoofer possesses a maximum output 300-watt power. With a dimension of 15.7 x 12.5 x 14 inches and weighing a meagre 25.5 pounds, this physically solid sub is good value for your money. The sub comes housed in an MDF cabinet that is given a brushed polymer veneer finish, which improves its durability and also helps it blend into your home décor. Furnished with a brushed black vinyl finish, you get a combination of performance and sleek design. For its price, the Klipsch R-10SWi 10-inch Wireless Subwoofer delivers exceptionally rich bass sound. One of its standout features is its effective port noise elimination. Its wireless technology operated within the 2.4GHz wireless band. This wireless connectivity annuls concerns about the positioning of the sub. This feature enables it to deliver deep, thrilling bass sounds without the use of subwoofer cables. Simply connect the pre-paired transmitter packaged alongside the sub to the subwoofer or LFE out on your receiver to begin wireless communications. The DSWPRO 660wi is made by the industry leaders themselves- Polk Audio. With a long list of bestseller subs and an illustrious line of home speakers and sub, their reputation in the market is the best there is. A very reliable brand. The DSWPRO 660wi ranks in our best ten wireless subwoofers list and is the perfect subwoofer addition to your subwoofer-less theatre collection. The package includes 1 Subwoofer, 1 Remote Control, 1 Owner’s Manual, 1 Power Cord, 1 Registration Card and 4 Rubber Foot Inserts. This product is made from an ideal combination of materials, geometry and construction technique to literally tune out unwanted resonance. 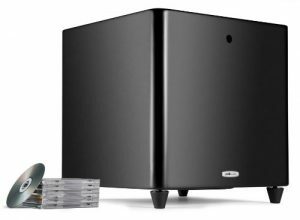 Ranking 4thon our best ten wireless subwoofer list, this system relieves your loudspeakers of the bass duty by providing high-quality bass sound emanating from the low-frequency notes from your music or movie. 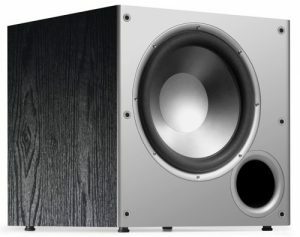 ThePolk DSWPRO 660wi has a dimension of 16.5 x 16.5 x 17.1 inches and weighs 45 pounds. Its Klippel optimized structure slot-loaded port design allows for improved voice coil alignment and suspension. The cabinetry is made of lightweight polypropylene cones and durable rubber surrounds that are engineered for your listening pleasure. This sub is endowed with a dynamic balance as with Polk’s other sub products and is built for maximum efficiency. Polk’s very own amplifiers have minimal heat dissipation and need less power to deliver a rich sound even at extreme listening levels. In the package, an Infrared (IR) remote control comes along with the item for ease of control and tuning. The volume could be adjusted from the remote as also the phase: 0°, 90°, 180° and 270°. Also, the remote could be restored back to the factory pre-set setting by using the RESET button on it. The success of the Dynamo line of subwoofers from MartinLogan has further spurred them to release newer and better wireless subwoofers. The Dynamo 700W is one of the new releases and it would surpass your expectation. This sub produces a deep powerful bass from a small enclosure. This item comes with a dimension of 11.69 x 12.53 x 12.54 inches and weighs 26.5 pounds. Its non-resonant cabinet design ensures very high efficiency of the sound being produced. Also, its high-resolution low-distortion 10-Inch woofer pairs a high-power magnet structure with a 10-inch diaphragm to deliver huge excursion that leaves you with an unending bass audio feeling. The Dynamo 700W comes with a ready wireless capability that is enabled through a built-in receiver and included SWT-2 transmitter. Operating in a 2.4GHz wireless band, its digital self-sensing design constantly adjusts to ensure optimal connection. The maximum wireless range is between 30 to 40 feet. Via a bi-directional feedback, the integrity of the signal being sent and received is monitored. With custom ETC (Energy Transfer Coupler) spikes, there is improved stability on the floor and better contact between the speaker and the floor. This best wireless subwoofer has the down-firing configuration as its standard configuration but it can easily be converted into a front-firing configuration without any hassles at all and without any tools too! This wireless sub gives your room a cable-less and clutter-free look in addition to precise sounds coming from your music, games, and movies. Looking for a real high-end performer? Here it is. 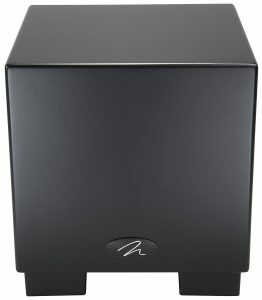 The MartinLogan Dynamo 1000W 12-inch Wireless Ready Subwoofer (Single, Black). This product is one of the best in the MartinLogan collection (if not the best). It uses a combination of a 12-inch high-powered magnet and a 10-inch diaphragm to produce ground-shattering bass sounds that are a true reflection of the low-end frequencies being hit. This product has a dimension of 14.6 x 13.7 x 14.5 inches and weighs 34 pounds. It comes with an already built-in receiver that makes it flexible enough to be placed anywhere when in use with the transmitter that comes with it. The high-resolution 12-inch woofer allows for low distortion while the 10-inch diaphragm delivers huge excursion. The product comes with factory-attached Energy Transfer Coupler spikes which ensure better contact between the floor and the speaker for enhanced sound production. The speaker has both front-firing and down-firing configurations and can easily be converted from one configuration to another without needing any tools. The Dynamo in the MartinLogan Dynamo 1000W is meant for the theatre room due to its front-facing and downward-facing speaker system. Designed with a non-resonant cabinet design, the MartinLogan Dynamo 1000W is the perfect representation of performance and power. Its advanced amplifier employs variable audio tracking power supplies to drive its class AB output stage for efficient delivery. This sub hit those low-end frequencies with precision and you just might get lost in the thrill of the sound you would hear. To aid you in choosing the best product that most suits your taste and meets your need, we have made a four-step process for choosing the best wireless subwoofer. Step #1: Take a look at the considerations highlighted in the Pre-Purchase Considerations for Wireless Subwoofers. Step #2: Go through our ranked list of best wireless subwoofers. Step #3:Narrow down the available options to 4 based on the considerations that most matter to you. Step #4: Go ahead to buy your preferred choice. Wireless subwoofers create audio impressions that satisfy your desire for a fuller hearing perspective when listening to music, playing games or watching your favourite movies. Our ranked list from 1 to 10 are the best products available on the market and each has its own distinct feature. Your choice should be based on the pre-purchase considerations highlighted earlier in this article. The SONOS SUB Wireless Subwoofer tops our ranked list on the overall because of its distinct internet compatibility feature, attractive design that perfectly complements your home décor and zero vibration. It, however, does not possess much power but is sufficient to thrill you. The MartinLogan Dynamo is also a very good choice but it just about comes in second and third behind the SONOS wireless sub. It, however, possesses more power than the Sonos. Wireless subs allow for easy and free placement anywhere within your listening room subject to a distance of 30-40 feet away from the audio receiver. This advantage is one that stands tall above other peer subwoofers. They are easier to set up as the connection between the transmitter and receiver is automatic once the sub is turned on. Many wireless subs also come with remote controls that use infrared (IR) technology for communication. These remote controls enable easy and convenient control of the sub to your listening preference. Unlike the wired connection used in other subwoofers, the wireless subs ensure a clutter-free environment as they make use of no connecting cables or wires to the receiver. Internet Compatibility: Some wireless subwoofers come with the added function of internet compatibility. Software updates and much more could be downloaded via the internet. App sync and control: Wireless subwoofers allow for app integration such that they can be controlled from your phones, tablets, laptops and other wireless compatible devices. Before purchasing your wireless subwoofer, it is of best practice that you consider certain factors before making your choice. Salient considerations that would help you derive maximum value from your purchase are highlighted and explained below. The frequency response of any subwoofer is very important in the production of that deep rich bass sound. Before purchase, ensure that the sub is able to respond to low frequencies and reproduce them to your hearing. 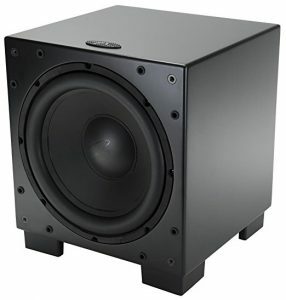 The power of a subwoofer determines the level to which it can perform and to what extent its bass intensity can reach. The power of a sub is measured in watts and manufacturers always include two of this power measurements- RMS (Root Mean Squared) power and Peak power. The peak power indicates the highest level of performance of the sub but this is not a true reflection of its performance as it could only be for a few seconds but the RMS power is also known as continuous power gives a better representation of the sub’s power. Choose subs that have a high RMS power for better performance. The size of your room should be one of the very first considerations to be made before deciding on your choice of wireless subwoofer. Smaller rooms may require that you buy subs with lesser power while larger rooms may demand subs with a higher power. Wireless subs come in one of two or in both configurations. The down-firing configuration and the front-firing configuration. The choice of the firing configuration is not as important but rather the performance of each configuration. However, having a wireless subwoofer with both configurations is an added advantage. Most wireless subs are easy to set up and can be configured by the Do-It-Yourself approach using the user guide or manual. Some, however, may require the expertise of a professional in setting them up or the need of some form of technical support. Best wireless subwoofer 2017 , Best wireles subwofer reviews , Best wireless subwoofer for the money , Best wireless subwoofer you should buy.